Spyder 7 HID 4x4 Fog Lights Black/Red Housing With Wiring Spyder 7" HID 4x4 Fog Lights Black/Red Housing With Wiring, 7" HID 4x4 Universal Fog Lights, 7" HID Universal Fog Lights, HID 4x4 Universal Fog Lights, Dodge Ram 7" HID Fog Lights, Dodge Dakota 7" HID Fog Lights, Dodge Durango 7&q [Spyder FL-CH-JK7004BR-C Lights] - $149.95 : 3rd Strike Performance, Your Source for Late Model MOPAR Performance Parts and Accessories! 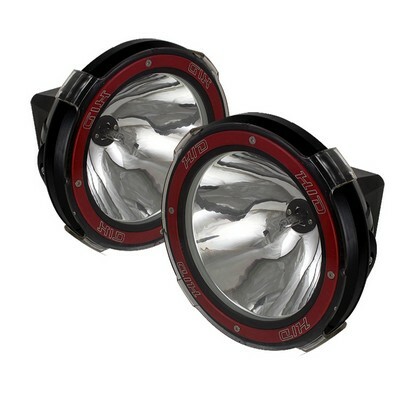 Increase visibility during heavy rain, snow, fog and night time driving. Designed as direct bolt-on replacement parts. These lights are made by an OE approved and ISO certified manufacturers and is a complete set (both sides included). Spyder supplies products from an overseas manufacturing plant. Their headquarters is in the City of Industry, California. Features / Specifications Weight: 8.15" Length: 20" Width: 10" Height: 8"